EY´s recently published Banking Barometer captures the sentiments of 100 Swiss bank´s executives. 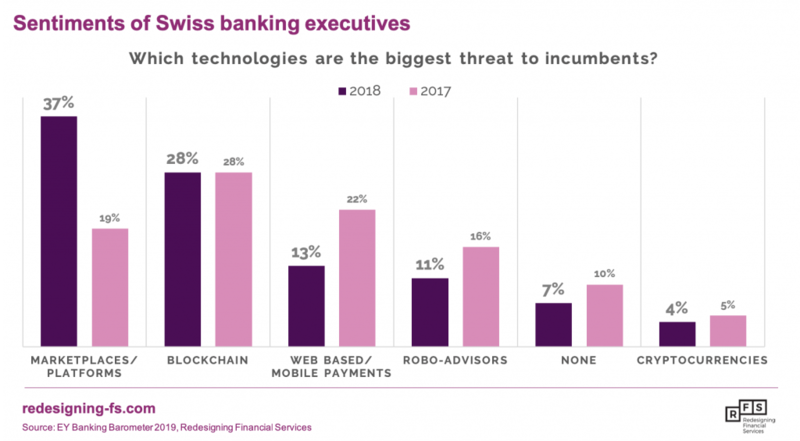 As it turns out, Swiss banking executives harbor several concerns about the banking outlook in 2019. 37% see platform providers (like Revolut and N26) as the biggest threat to their businesses in 2019. Only about a quarter are concerned about blockchain disruption. The threat of robo-advisors has fallen significantly over the last year. And only 4% consider cryptocurrencies a threat to their business this year.